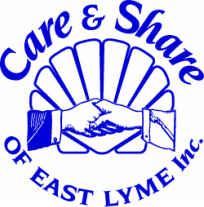 Giving - Care & Share of East Lyme, Inc. Volunteers and contributors make it possible for Care & Share to provide support to families and individuals in our community. We are run entirely by volunteers, with no paid staff. With the time, money, ideas and talents generously shared by many members of our community, we are able to positively affect the lives of many. We invite you to join us in meeting our community’s growing need for assistance.